O How I Love Thy Law An illustration of laws made to protect us helps us to understand that God's law is for our benefit. The Ten Commandments The Ten Commandments from the King James Version of the Bible. Unfolding God's Glorious Law Each commandment with a brief explanation of its meaning. In Harmony with Heaven The mission on earth of Jesus related to God's law. The Ten Commandments and religious liberty. Voices for Liberty Religious liberty quotes from US founding fathers and others. The Law of the Lord is Perfect The perfection and unchangeable nature of God's law. Converting the Soul The role of God's law in leading people to Jesus and eternal life. Remember the Sabbath The significance and importance of the Fourth Commandment. More Precious than Gold Bible verses tell the value of God's law. Amazing Facts about the Sabbath What the Bible says about the Sabbath ... and Sunday. Your Thought Questions Answered Answering some questions that arise when the Sabbath is discussed. Who Changed the Sabbath? One church claims to have changed the Sabbath from Saturday to Sunday. The Law of God The Ten Commandments in the Old Testament, New Testament and as changed by man. Making the Sabbath a Delight How to keep the Sabbath and why. The Bible Says ... The role of the Ten Commandments in Old Testment times, New Testament times, and our time. The Sabbath: A Test of Loyalty The Sabbath in the future of the war between good and evil. 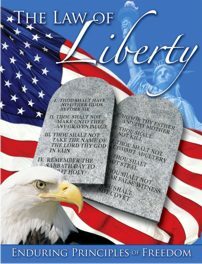 Note: "The Law of Liberty" magazine in printed form is 32 pages, approx. 8" x 10.7". Web page created: 04/05/06 Updated: 07/27/06. Background courtesy of www.grsites.com.